I haven't blogged about Depeche Mode over here yet, but basically you should know they are my all-time forever favourite band (as is Cloud Cult). I've been slowly working my way through their discography, buying an album every now and then as a treat to myself. I like to appreciate and savour their music. (I still need Speak and Spell, A Broken Frame, Some Great Reward and Exciter). It's not very often (well, never, really) that I come across a band I love so much that has so much history. 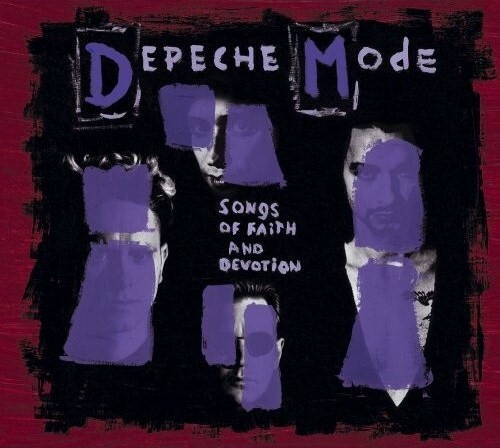 This album is one of two (Ultra is the other) that came out during Depeche Mode's 'rough patch' (Martin was drinking excessively, Dave wanted to be a rockstar [read: got into fights, grew his hair long, overdosed on heroin, etc.] and Fletch was having nervous breakdowns). I was prepared to be less than impressed with this album. Ultra was much better than I expected, however, and so is Songs of Faith and Devotion - it shattered my expectations. There are three main reasons why I love DM. Martin's lyrics. Not a lot to say here. Kind of self-explanatory. None of the songs on this album really spoke to me lyrically, but they were all still very enjoyable. Dave's vocals. This I can elaborate on. I love Dave's voice. It is fantastic. I bought his solo album because anything he sings will sound like Jesus. Anyhow. Some of the vocals on Songs of Faith and Devotion tend to have a much rawer sound (see Condemnation, Right With Me and Rush). This is definitely not a bad thing. A bit of a change is good. He still sounds great, he can pull it off. My favourite line, though, is from Walking In My Shoes: 'You stumble in my footsteps'. It's there that you can hear what I really love about Dave's voice. Also, the chorus of In Your Room. The vocals are why those are my favourite songs. Hokay. I think that's enough of my lavishing praise. This album confirms it for me: Depeche Mode can do no wrong, heh.